For years people have been able to use simple digital keypad locks to control access to doors and cabinets without the hassle of using keys. Key management is often a concern, especially in large offices or public buildings where keys are easily lost or stolen. Electronic digital keypad locks are far more convenient to manage on a large scale; if codes are forgotten or compromised, the locks can be reprogrammed in minutes. Digital door and cabinet locks have many applications within the modern office environment. Larger keypad locks with full-sized lever handles are often used to control door access to meeting rooms, supply cupboards and IT areas. Cabinets containing confidential files or medical supplies are often secured with smaller digital cabinet locks. The need for more flexibility within the office workplace has led to a demand in lockable furniture, especially desks. When office workers ‘hot desk’ for example, they need somewhere safe to secure belongings while at lunch or in meetings. Digital keypad locks are perfect for this application because, when set in Public Use Function, the user can select his/her own four-digit access code, which will lock and open the drawer only once – leaving it free for the next user. 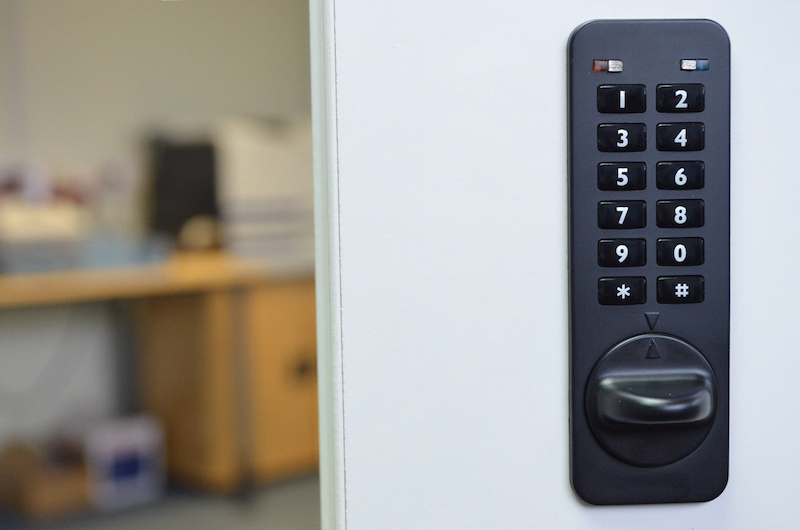 Many digital cabinet locks are too big and cumbersome to work well or look good on desk drawers, so we’ve designed a much smaller, sleek-looking keypad lock especially for this application. The result is the new KitLock NANO90 – a compact digital keypad lock with a footprint of just 30 by 90 mm. As office desks are designed for both function and appearance, the KitLock NANO90 can be fitted flush to the surface of the drawer and is available in a range of modern colours. Flush-mounted locks are more secure than surface-mounted locks because it is much harder for someone to break the lock off completely. A flush-fitted NANO90 has a smart, sleek look too. The KitLock NANO90 provides an almost ‘fit and forget’ locking solution, performing up to 100,000 operations from just one coin-cell battery. A red LED light flashes to indicate the drawer is locked. As well as the User Code, the KitLock NANO90 can be opened using a Technician Code, a Sub-Master Code and a Master Code. Using a Master Code, any program on the lock can be changed. Lock master codes are held by the person with overall responsibility for security: the head of facilities or building services, for example. He or she might issue Sub-Master Codes to employees in the same department. Sub-Master Codes allow the lock to be accessed, but will not allow the Master Code to be changed. Technician Codes are useful if drawer contents need to be checked without erasing the code selected by the user. The simple design of the KitLock NANO90 will appeal to many office furniture companies, who will fit the lock to desk drawers during the manufacturing process. However, the locks can just as easily be fitted in place of locks and keys on existing office furniture. Programs – Private Use and Public Use Function, and Auto Unlock. Private Use Function is the default mode for the KitLock NANO90. In Private Use Function, the same code can be used over and over again. This function is ideal when only one person needs regular access to the desk drawer. In Public Use Function, a new code is selected each time the drawer is locked and unlocked – making it ideal for short-term, multiple occupancy. The KitLock NANO90 also has an Auto Unlock feature, enabling it to be programmed to open after a set duration, for example 2, 4, 6, 8, 10 or 12 hours. Finish – silver grey as standard. Black and white available on request. Codes – four-digit User Code, six-digit Technician Code, eight-digit Master and Sub-Master Codes. Low battery warning – a red LED light will flash on opening to indicate batteries need to be changed. Existing codes are not erased when batteries are replaced. Battery override – A PP3 battery can be placed against external contacts to enable the lock to be opened if the internal battery fails while the lock is in use. For more information visit the product page on our website or call 01635 239645. Codelocks will be exhibiting at Interzum, 5-8 May, Exhibition Centre, Cologne, Germany. Come and visit us in hall 3, stand B-048.